Figure 2.2:Plotting a complex number as a point in thecomplex plane. We can plot complex numbers in a plane as ordered pairs , as shown in Fig. 2.2. 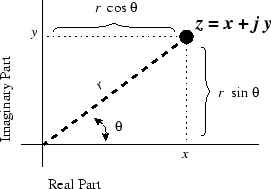 The complex plane is any 2D graph in which the horizontal axis is the real part and the vertical axis is the imaginary part of a complex number or function. As an example, the number has coordinates in the complex plane while the number has coordinates .